Saint Leo University appears in our ranking of the Top 10 Cheapest Online Master’s in Information Assurance Degrees. At Saint Leo University, students find computer science programs at the associate, bachelor and master degree levels. All programs are offered online or on the main campus outside Tampa, Florida. Additionally, Saint Leo University has Education Centers in California, Florida, Georgia, Mississippi, South Carolina, Texas, and Virginia, enabling students in those areas to take on-campus classes. Students may choose from two computer science degrees at the associate degree level. These are Cybersecurity and Information Technology. With the Cybersecurity associate level degree, students are prepared for entry-level employment in this field. Sample courses include Computer Systems, Programming Logic and Design and Fundamentals of Cybersecurity. The Information Technology Associate Degree program is designed to enable students to fulfill entry-level roles in the IT field. They may take courses such as Computer Architecture, Systems Analysis and Design, and Network Theory and Design. Bachelor of science degrees in Computer Information Systems, Computer Science – Information Assurance and Cybersecurity additionally are available. The Computer Information Systems program provides the skills for students to become a systems analyst, IT project manager, web developer or a network administrator. Courses such as Database Concepts and Programming, Web Design, Introduction to Internet Applications and Introduction to Information Security all may be encountered. Prospective students who select the Computer Science – Information Assurance degree prepare themselves for careers as a web developer, software engineer, database administrator, computer programmer or network administrator. This is accomplished through courses such as Programming in C/C++, Theoretical Foundations of Computer Science, Algorithms and Data Structures, Software Engineering and Artificial Intelligence. The Bachelor of Science in Cybersecurity features an expansion of the knowledge gained in the associate degree program. With in-demand careers such as cyber analyst, security engineer, information security analyst and information security engineer awaiting graduates, most students have no problem finding employment. In addition to the computer science courses included in the lower-level degree, this program includes Penetration Testing, Management of Information Security, Internet/Intranet Security, Computer Forensics, Network Defense and Security and Disaster Recovery. Saint Leo University further offers a Master of Science in Cybersecurity. This program is offered at the university’s Education Centers and online for greater flexibility. Students complete 36 hours of coursework in classes such as Strategic Planning for Cybersecurity, Advanced Networking & Protocols, Web Services Security, Principles of Cybersecurity Management and Cybersecurity Risk Management. 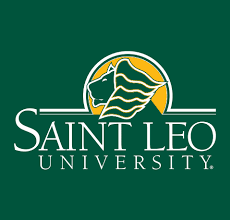 Founded in 1889, Saint Leo University is a Roman Catholic liberal arts institution that serves students of all faiths. It is a private, non-profit university with a primary campus in St. Leo, Florida just 35 miles to the north of Tampa. Saint Leo College began operations in September 1890 with seven students, one of whom as only 12 years-old. The first graduates earned Master of Accounts degrees in 1893. While state law forbade the co-education of black and white students, Saint Leo admitted a black student from Cuba in 1898. The Benedictine monks and the student are commemorated in a sculpture on the school’s main campus today. The following decades would bring a multitude of changes, including several alterations to the name. At one point, it was called St. Leo Military College and at another Saint Leo College Preparatory School. The current name was bestowed on the institution in 1999 at the same time that the college’s athletic teams began calling themselves the Lions. U.S. News & World Report named Saint Leo one of the Best Regional Universities in the South and the Best Value University in the South in 2018. In 2017, the same publication declared that Saint Leo’s possessed one of the Best Online Bachelor’s Programs as well as being among the Best Online Bachelor’s Programs for Veterans. For several years, Saint Leo also has been recognized by Military Advanced Education & Transition as one of the foremost higher education institutions serving the needs of active military and military veterans. Military Times offered a similar accolade when it named Saint Leo University as one of the Best for Vets: Colleges 2017. The Southern Association of Colleges and Schools Commission on Colleges accredits Saint Leo University to confer associate, bachelor’s and master’s degrees. Additionally, each of the university’s Education Centers is licensed within the state where it is located. Freshmen who want to attend a program at the university campus in Florida must provide proof of the completion of a high school diploma. An online application with fee and an official high school transcript are required. Optionally, students may include a letter of recommendation from a teacher or guidance counselor. Saint Leo currently has no requirement for the submission of SAT or ACT scores. Students may submit their test scores if they choose to do so. Students planning to attend on-campus are encouraged to schedule a visit before completing enrollment. Applications for online or Education Center programs are considered on a rolling basis. A total of six start dates are available throughout the calendar year. Prospective students must complete an online application, submitting it with a non-refundable fee. Proof of high school graduation and official transcripts are required. If applicable, students may be asked to submit standardized test scores from examinations such as Defense Activity for Nontraditional Education Support, College-Level Examination Program or Excelsior College Exams. Applicants for graduate programs complete an online application, submitting it with a fee and current resume. Two professional recommendations are required along with a 500-word Statement of Professional Goals. GMAT scores may be requested, and students must be prepared to submit official transcripts from undergraduate programs. For associate and bachelor degrees offered online or at the Education Centers, students pay $360 per credit hour. Students at the university campus in St. Leo pay $11,200 per semester, with enrolling in one to 11 credit hours costing $580 per hour. Graduate students enrolled in the Master of Science in Cybersecurity pay $770 per credit hour. Saint Leo University maintains online databases of scholarships for which students may apply. Military and veteran benefits are widely accepted by the university, and a wide variety of student loans similarly are available. Prospective applicants may learn more about Saint Leo University’s computer science programs by visiting their website.